TRUTH: Height, pointy shape, and isolation are the dominant factors controlling where a lightning bolt will strike. 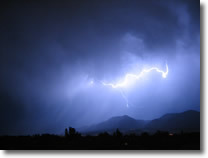 The presence of metal makes virtually no difference on where lightning strikes. Mountains are made of stone, but receive many strikes each year. 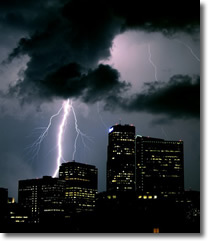 When lightning threatens, take proper protective action immediately. Don’t waste time shedding metal off your body, or seeking shelter under inadequate structures. But while metal doesn’t attract lightning, touching or being near long metal objects (fences, railings, bleachers, vehicles, etc.) is still unsafe when thunderstorms are nearby. If lightning does happen to hit it, the metal can conduct the electricity a long distance (even over 100 yards) and still electrocute you. Source: National Weather Service Lightning Safety Website. This entry was posted on Sunday, May 4th, 2008 at 7:23am MDT and is filed under Colorado Weather, Severe Weather, Thornton Weather, Weather Education. You can follow any responses to this entry through the RSS 2.0 feed. You can skip to the end and leave a response. Pinging is currently not allowed.